Discover delicious Cantonese cuisine and opulent Chinese décor tucked inside a stately Victorian façade. Dine on dim sum, barbecued meats, vegetables and seafood in an elegant table-service restaurant hosted by Maxim’s. 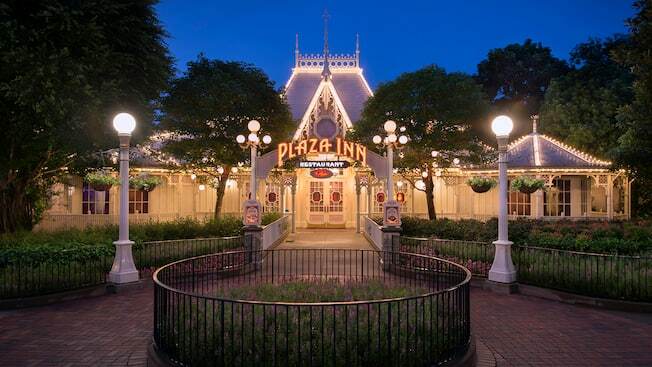 From the outside, Plaza Inn looks like a grand turn-of-the-20th-century Victorian building, but the interior features rich and colorful Asian design and furnishings. What explains this marvelous merging of cultures at Plaza Inn? The American owners traveled abroad and fell in love with China. When they returned home, they converted their staid Main Street, U.S.A. restaurant into an homage to the wonderful flavors and decorative arts of China. The reconfigured restaurant was a huge hit, attracting new customers from miles around. Taste the delectable results by sampling the crispy skin on the roasted suckling pig, savory chicken with spicy and pungent sauce, crunchy deep-friend sliced garoupa in corn sauce, braised mushrooms with bamboo shoots, wok-friend pork loin with black vinegar sauce, 3-head size whole abalone or Plaza Inn’s signature dim sum—including the giant steamed lobster dumpling or the pan-fried pork, beef and pepper bun. For an extra treat, be sure to add the fragrant whole abalone with rice, wrapped in a lotus leaf and steamed to perfection. Finish your meal with a sweet delight, like the miraculous Mickey mango pudding. Pay attention to the intricate details inside Plaza Inn for some extra special surprises. Watch the artful array of lanterns in the center of the restaurant and see how they slowly change from one color to another. Fans of the Disney movie Mulan should be sure to take a look at the large wall murals—the artwork was originally created during the artistic development process for the classic animated film. In addition, if you closely inspect the carvings at the top of several columns, you’ll find that they resemble Mulan’s comical dragon sidekick, Mushu. Hong Kong Disneyland is filled with Hidden Mickeys, but Plaza Inn might have the only Hidden Mushus!